In the winter, we often turn to the tropics to get our fruit fixes. Bananas are the most popular fruit in America, and they’re quite popular elsewhere, too. I’m happy with oranges, grapefruits, and chocolate (yup, cocoa beans are fruit – great news for fruit-lovers!) but sometimes it’s nice to throw something else in the mix, and I’ll grab a pineapple, some kiwifruits, a few avocados, or a bunch of bananas, when doing my food shopping. 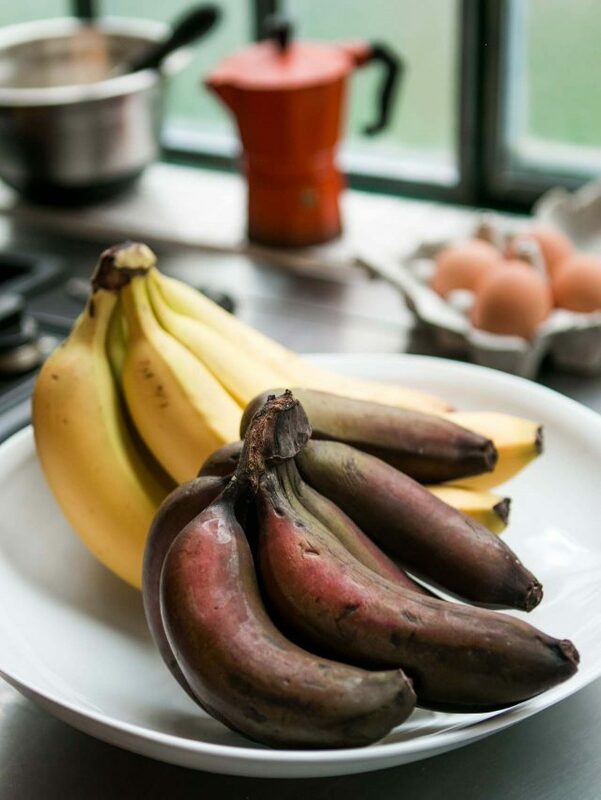 While I was waiting for my yellow bananas to ripen, a few days later I came across these red bananas at the market. I love red bananas, which have a more pronounced flavor than yellow bananas, but are hard to come by in France, and elsewhere. (They should be dead-ripe when you use them. The skin will turn quite dark when they’re ready.) So jumped at the bunch when I saw it, and put those in my fruit bowl to see who would ripen first. Speaking of differences, I have a different kind of Banana Chocolate Chip Upside Down Cake here on the site (which is low fat), but wanted to do a skillet version. I also wanted to try using teff, a whole grain flour that I’ve been interested in experimenting with. 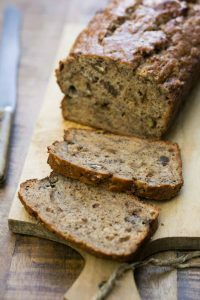 It’s quite prominent in Africa cooking, as it seems to thrive in difficult conditions (which I often feel like I do, too..), but also adds a nutty flavor to baked goods. So when I was at the natural food store to pick up the organic yellow bananas, I grabbed a bag of teff flour, too. 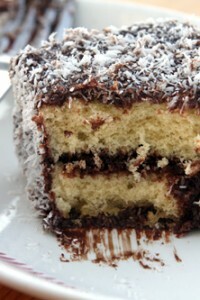 Regardless of the little bit of cinnamon I stuck in there, this cake was a big hit. It was a nice respite in the winter, and a good addition to my fruit dessert repertoire. (I’ve got the chocolate ones pretty well-covered.) However I’d feel proud turning one of these upside down cakes out any time of the year. I made this cake with teff flour. It available at most natural foods stores and online, but I've given measurements for using all-purpose flour. You might want to reduce the salt to 1/2 teaspoon in the batter if you do. The hardier taste of whole grains seems to call for a little more salt to be added, to my taste.In place of the vanilla bean, you can use 1 teaspoon of vanilla seeds or paste for the bean. For more on vanilla, check out my Vanilla FAQs. Your bananas should be ripe but not mushy-soft. They'll sweeten in the caramel. If you want to leave out the rum, you could replace it with fresh lime juice, or simply omit it.If you don't have a cast iron skillet, this can be made a standard 9-inch (23cm) cake pan (not a springform pan, which would leak during baking). 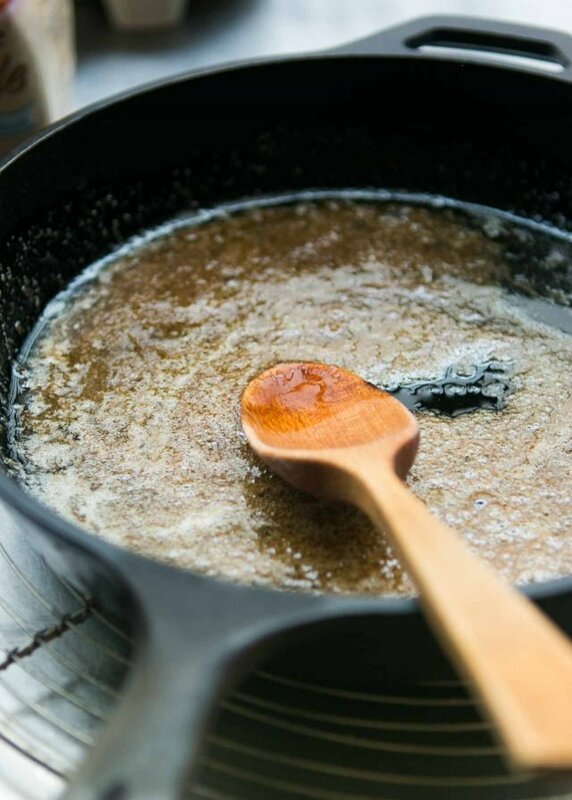 Make the brown sugar topping in a regular skillet or pan, then pour it into a cake pan while it's still warm. Cut and lay the vanilla bean and bananas on top. 1. To make the topping, heat the 4 tablespoons (55g) of butter, brown sugar, and seeds from the vanilla bean, in a 10-inch (25cm) cast iron skillet on the stovetop. (Add a sprinkle of salt if using unsalted butter.) Stir until the butter and sugar are liquified and start to bubble. Remove from heat and stir in the rum. Add the split vanilla bean to the skillet. 2. Peel the bananas and slice them in half lengthwise, into thirds, and arrange them over the brown sugar topping in the skillet. Preheat the oven to 350ºF (180ºC). 3. To make the cake, whisk together the flour(s), baking powder, salt and cinnamon,in a small bowl and set aside. 4. In the bowl of a stand mixer fitted with the paddle attachment, or by hand in a medium bowl using a sturdy spatula, beat the butter with the granulated sugar until light and fluffy. Add the eggs one at a time, stopping the mixer between the additions and scraping down the sides. 5. On slow speed, mix in half of the dry ingredients, then the milk and vanilla, then the rest of the dry ingredients, mixing only until they're just incorporated. Do not overmix. Scrape the batter over the bananas in the skillet and bake the cake for 30 to 35 minutes, until the cake feels done when you press it in the center. A toothpick inserted into the center should come out relatively clean. 6. Remove the cake from the oven and let stand for 10 minutes. Run a knife around the outside of the cake to help it release from the pan, and turn it out onto a serving platter or cooling rack, wearing oven mitts and taking care to avoid drips from hot caramel. Any caramel bits that may have stuck in the pan can be spooned back over the warm cake. Serving: This cake is best served the day it's made, preferably while warm, but can be served at room temperature. I like it served on its own but it could be served with softly whipped cream or a scoop of vanilla ice cream or cinnamon ice cream. Storage: The cake will keep for up to four days, if well-wrapped, at room temperature. I would not recommend freezing it as the texture of the fruit may change. Would like to use all teff, which is how it seemed you made it. However, recipe calls for APF only or APF plus teff. Would all teff work? I made it with a combination and teff and all-purpose flour. Teff is very heavy (and has no gluten) so the cake would be quite dense and probably not hold together well. You need some amount of all-purpose flour (or another flour, that would provide the same lightness and structure) if you wanted to mix it with something else. If you do try it with all teff, or mix it with something else, let us know how it turns out. 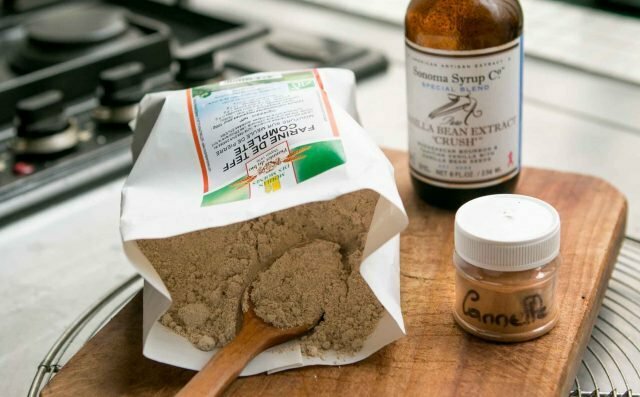 What do you think of using almond meal instead of teff? Sure, I think that would be great. all teff would not work (it would be a brick-cake) but you could subs a gluten free APF to the normal APF one. if you would like to use a ‘pure’ flour and not a pre-mixed one you could google home-made recipes for GF flour blends – you need something tho hold this cake together, if it’s not gluten it needs to be something else usually provided in the GF APF mixs. Which bananas did you end up using? I made this cake twice this week, and I used the yellow bananas in one, and the red in the other. Both turned out great! I really should eat breakfast before I read your columns. The pictures are mouth watering and by the time I finished reading through this one, toast with avocado didn’t sound like what I wanted to eat. And nothing else did either. And how does Romain feel about nutmeg? I’ve always felt that nutmeg and vanilla was the flavor combination for bananas. He likes spices but the French, in general, don’t add them by the teaspoon (or tablespoon!) like Americans do, the one exception being pain d’épices. To their palates, the heavy spicing is overwhelming, on its own, or with other flavors, but to other cultures and cuisines (including highly spiced Indian and Thai foods), the spices are part of the flavor. A stunning cake! Will definitely make. I can smell the caramel, vanilla and banana through the screen. I think some crème fraîche d’Isigny would be great with this too. I love bananas. This looks great and one of the reasons is that it’s a lovely dark colour. 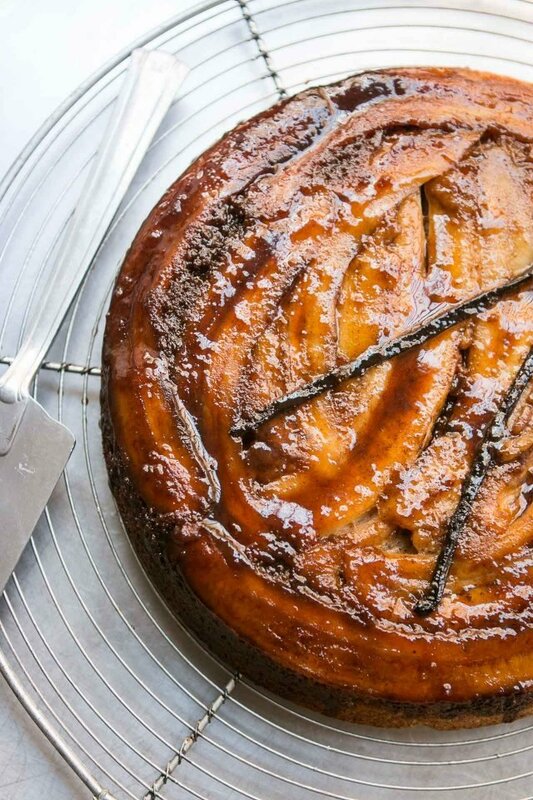 Insipid looking upside down cakes and tartes Tatin are most off putting. Oh, my! Cannot wait to try this yummy dessert! I love Bananas Foster and this seems a bit like it. Thank you for the recipe! Your upside down cakes are all the bomb! I still get requests for the cranberry upside cake, which I have done as well with pineapple. Must try this one! Thanks! The cake looks amazing. I have never seen vanilla beans included in a cake before. It seems like they would be tough and stringy when cut and served. Do you include vanilla beans in other baked goods? Wondering if spelt flour would work as well…………..
Trop de cannelle. Sounds familiar. I wonder if there’s a cinnamon appreciation gene that many Europeans are lacking. I’m Belgian but lived in the States for a while and I get this comment all the time from my partner (and his family). “We really like what you bake but what’s with the cinnamon?” Frustrating. Thinking I brought cinnamon from a recent trip to Sri Lanka so I have absolutely the best stuff in my pantry, not being able to use it like I would. AARGH. David, I love your emails, and always follow the link to see the rest of the story. 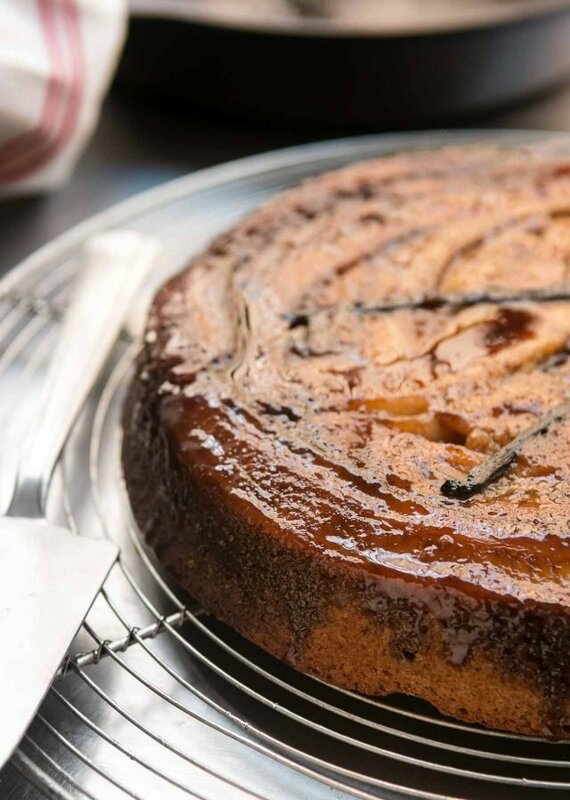 This banana upside down cake sounds really really wonderful! And your photos make it possible to eat with our eyes! I know you work so hard on these posts to make sure everything is accurate, and your accounts of how difficult that is to achieve, I feel a bit ashamed to have pointed this tiny error out. No problem : ) I’m using a recipe plug-in now, which makes the recipes possible to be printed out, but means that I have to plug all the ingredients and instructions into individual modules, so it’s harder to catch those things. Thanks for letting me know so I can correct it. A very appealing alternative to banana bread and chocolate dipped frozen bananas! Can’t wait to try it but I just cleaned out my supply of ripening bananas over the weekend. Love the recipe as it also saves on electrical use with not having an oven on to bake a cake. Never had read one could make a cake this way. Did some reading about bananas and discovered IF the yellow variety of banana (and I guess other types too) are pulled apart when arriving home, the ripening will slow down. If they are left as a bunch, they will ripen more quickly. Thanks for always having such interesting recipes and photos, not forgetting your anecdotes too. Happy New Year. Confused. Bananas sliced in half lengthwise, in thirds. In thirds lengthwise or across?? The picture would suggest lengthways, I.e., 6 thin, long slices per banana. Yes, slice them lengthwise, into thirds (three pieces). So you should end up with three lengthwise slices. So 1 banana = 3 slices? 1 banana > 6 slices seems rather thin slices. 4 bananas would be 12 slices? Beautiful, and I sooo have plans for this one! Now, not to get off task, but recently heard that some cultures, including India, have culinary uses for banana PEELS. As a waste-not type who is always eyeing the scraps, I am intrigued. Banana peels are bitter. And a weird challenge. Ideas? We use the banana peel of extremely raw bananas, so it firm, holds shape and doesn’t taste bitter. I haven’t come across anyone using peels of ripe bananas here in India, not sure about other cultures though! I would just make sure to get organic bananas if you plan to consume the peels. Conventional bananas are heavily sprayed so I seek out organic bananas for that reason. My late cousin ate a banana every day. Finely chopped the peels and put them around his azalea plants. Fabulous azaleas so they must have loved bananas, too. Just gobbled up the first slice of this delight. Not having teff, I substituted 1/4 cup of whole wheat pastry flour. It came out of the pan easily after an 8 min rest. The smell is amazing. The texture is fine. I loved it. Thanks for letting us know the whole wheat flour works well! I’ve seen teff around a bit, but I really want to bake with some to see what it’s like. I’ve also never heard of red bananas, they look so cool. Delicious looking cake, I love bananas. 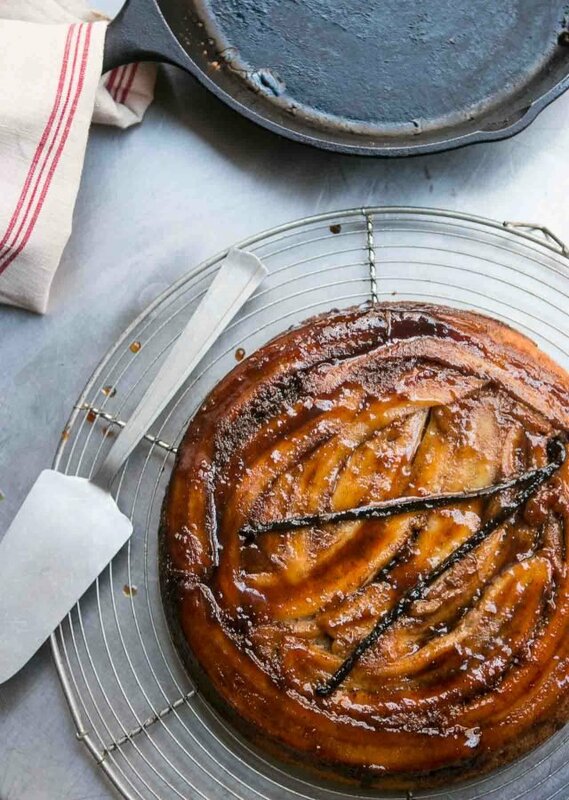 I love the idea of making an upside down cake in a cast iron skillet. And the teff flour sounds fascinating- I’ll have to go hunt some down. The vanilla bean looks lovely on the cake! And I think nutmeg might work as a nice subtle spice too. I love the variation in flour – I buy these interesting flours on impulse and then rarely know what to do with them. Yellow bananas are Cavendish which have become a monoculture in the last 40-50 years because they shipped well despite inferior flavor. It is almost a waste to use delicious red bananas when your upside-down cake is a great way to rescue the Cavendish. David is this good for bananas that are a bit too ripe, I usually freeze those for banana bread and cake making. “Your bananas should be ripe but not mushy-soft” – If they are too ripe, they will not hold their shape and turn to mush. If your bananas are soft and gushy, I advise not using them. I have never heard of red bananas. Will look out for them in future. I can just taste that cake, looks so scrumptious. Made as written, with only two bananas, sliced obliquely, using the option without the teff. And it was perfect. No leftovers. Very well received. 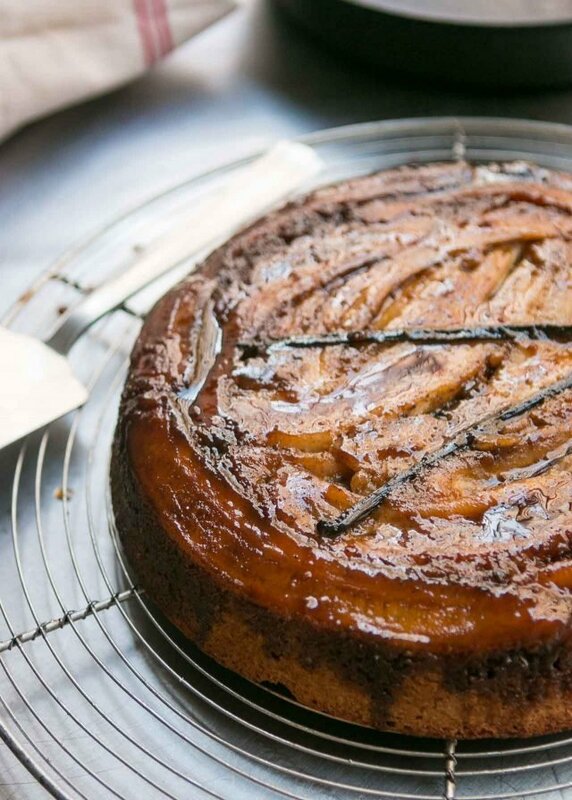 What a fabulous idea – never thought of using bananas in an upside down cake but it makes total sense! 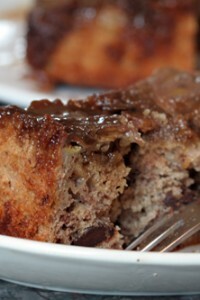 very interesting re: teff for this recipe and your having to forfeit heavier dose of cinnamon! The vanilla bean and rum for the banana cinched it for me though, thank you for this! Oh, I saw red bananas yesterday and was wondering what I could do with them! Thanks, I’ll go buy some and try this cake–I don’t really cook anymore but this looks too good to pass! I made it last night for a dinner party. Huge hit. It was so good. I didn’t use the teff and omitted the rum (don’t like the flavor) – will make again. One suggestion – place a baking sheet under the pan. There was some over dripping from the sauce. Looks amazing. Quick question. Do you remove the vanilla bean before serving? I leave it in because I like the way it looks. (Like bay leaves, I think people know to eat around it.) But if you feel like you should remove it, you can. Thank you David! You are a treasure! This cake is spectacular. Thank you for posting the recipe. I just had my third piece for the day, this one slightly warm with a generous scoop of French vanilla ice cream. Heavenly. This cake looks divine, you are a wizard! I just wanted to report that when I came home to make this yesterday, I didn’t realize there was only about 1/4 cup of granulated sugar in the house. I divided it between the caramel and the cake and topped up with maple syrup, while not adjusting any other measurements. I baked it for 20 extra minutes covered in foil (55 total). Other than being slightly moist and dense, it was still divine. Thanks! David – I don’t have a cast-iron pan but can I use an enameled pan – like le creuset? Am not sure what type of Le Creuset pan you’re referring to (most of mine are either two-handled casseroles and gratin dishes), but if you have one that resembles a skillet that should work. Otherwise you can make the topping, pour it into a solid (not springform) cake pan – similar to these, and make and bake the cake in that.